This is my vegetarian version of a Moroccan chick pea and lentil soup, traditionally served to end the fast of Ramadan and usually cooked very slowly in meat stock, over an open coal burner. You'll find this meatless version almost as rich and definitely as filling as the traditional thing. It's important that the chick peas are absolutely tender, so cook them for as long as you have to. All pulses will cook differently according to their age; the older they are, the longer they'll take to cook. 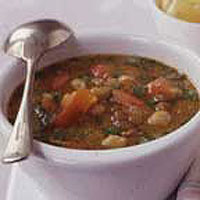 If you have a pressure cooker, you might like to cook the soup in that - it can halve the cooking time. This soup is even more delicious if made a day ahead and reheated. The day before you want to serve the dish, put the chick peas to soak in plenty of cold water. Uncover the pan and test the consistency of the chick peas. Return them to the boil and simmer until you are satisfied that the chick peas are completely soft with no trace of chalkiness - this may take up to 30 minutes. Add more water if you like, but bear in mind that the soup should be thick. When the chick peas are cooked, add the saffron and its soaking water and cook for 5 minutes more so the chick peas are starting to break up. Just before serving, add the remaining 2 chopped tomatoes, then the parsley and coriander, reserving a little of each for garnish. Season with Tabasco, salt and pepper. Stir in the lemon juice, add a scattering of parsley and coriander on top and drizzle over the extra virgin olive oil. Serve with lemon wedges and a stack of oven-warmed or pan-toasted wheat tortillas by the side.